← John Legend & Common Win Oscar For ‘Glory’! Her primary work was as a memoirist and poet; she recited a poem at President Bill Clinton’s 1993 inauguration. She was awarded the Presidential Medal of Freedom in 2011 by President Obama. Born Marguerite Johnson in St. Louis and raised partly in Long Beach before her parents split, Angelou was sent to live with her grandmother for four years in the town of Stamps, Ark. — yes, a town called Stamps. 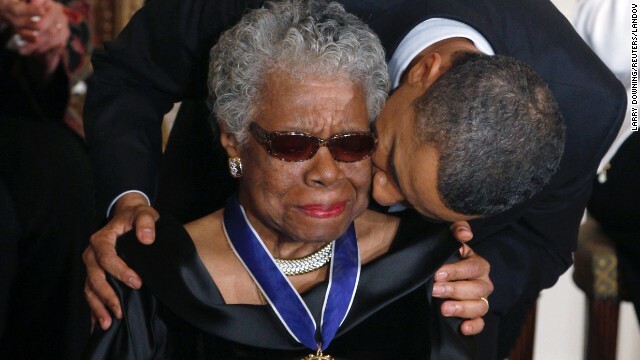 Angelou suffered as a child — she was raped by her mother’s boyfriend. She spoke up about the abuse and he was found guilty and was then murdered, prompting Angelou to stop speaking for five years. Literature helped pull her out of her silence. Her books include the poetry collections “Shaker, Why Don’t You Sing?” (1983), “And Still I Rise” (1978), “Oh Pray My Wings Are Gonna Fit Me Well” (1975) and “Just Give Me a Cool Drink of Water ‘fore I Diiie” (1971) and the memoirs “A Song Flung Up to Heaven” (2002), “All God’s Children Need Traveling Shoes” (1986), “The Heart of a Woman” (1981) and “Gather Together in My Name” (1974). Maya Angelou recites her poem “On the Pulse of Morning” at the 1993 inauguration of President Bill Clinton. Her last book was the memoir “Mom & Me & Mom,” published in 2013. The date of the Maya Angelou stamp’s release has not been announced. Its artwork has not yet been revealed. We can’t wait to get ours! This entry was posted in Gossip and tagged Am Caffeine morning show, Barak Obama, Maya Angelou, Stamp. Bookmark the permalink.